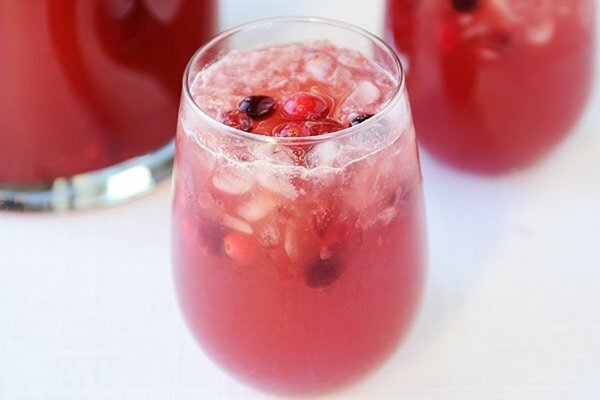 Elegant and delicious, this sparkling apple cider cranberry punch is festive, beautiful, absolutely delicious, and so easy to make! 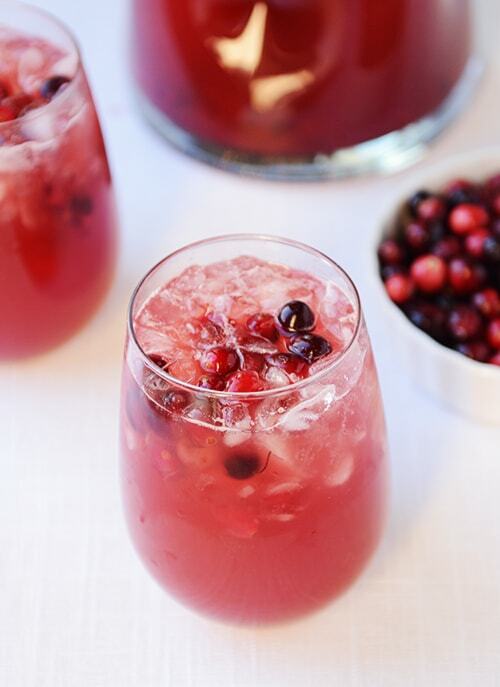 Well, the good news is that this festive cranberry punch is just as tasty as it is pretty. And. Guess what? There isn’t any bad news to follow. With an intro like that, I’d be a little worried to hear the news that to get this lovely pitcher on the table, it would require a 3-day, intense process to brew my own ginger ale and grow organic, backyard cranberries (both of which would take far longer than 3 days now that I think about it). Nah. None of that nonsense here (especially since I clearly don’t know what I’m talking about with either aspect). This delicious fizzy concoction is festive and simple. We gulped this apple cider cranberry punch down on an average Saturday afternoon as I was playing around with quantities to get the flavor spot on and we all agreed it is a winner. Those cranberries. Seriously. They add just the perfect tartness to the zippy, lightly sweet drink. 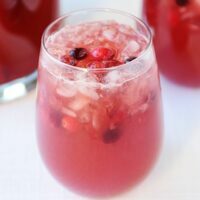 My kids, deprived children that they are seeing as how they are only offered water or milk at dinner, basically think we ought to serve this cranberry apple cider punch at all meals from now until forever (yes, breakfast too). I crushed those dreams pretty quickly. But never fear, their tender souls were saved, evidenced by the cheering, when they found out it would be appearing again for Christmas Eve dinner. And yes, I am whole-heartedly giving thanks right this minute for children who have very low expectations about life and beverages; I’ve been forewarned that reality will not be this simple forever. 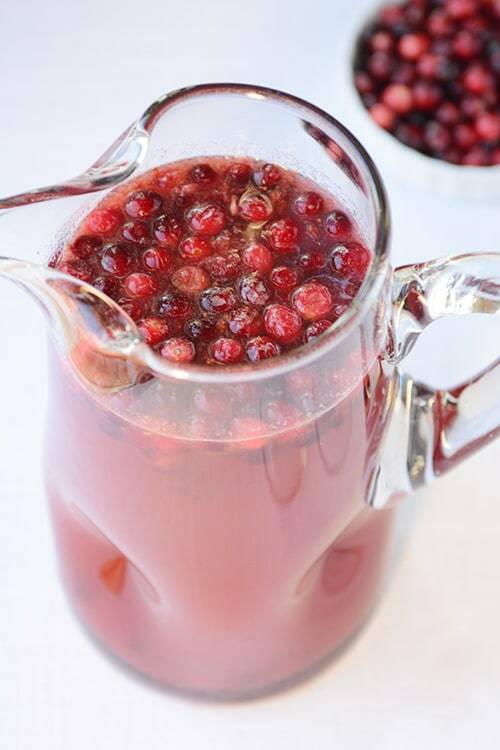 In a small saucepan, combine the cranberries and water and simmer for 2-3 minutes until the cranberries pop and split. Remove from the heat and stir in the sugar. Let cool to room temperature (or chill in the refrigerator). In a 2-quart pitcher, pour in the cranberry mixture. Add the apple cider, ginger ale, lemon juice and cranberry juice. Mix. Serve in cups with crushed ice. The flavor of this punch is best using apple cider that is fresh-pressed, meaning, not the kind that is clear like apple juice - it should look slightly cloudy (but you could use the kind in the juice aisle in a pinch). Also if you can't find 100% cranberry juice, you can try using a blend but you might want to cut down on the sugar in the recipe. I like to use Vernor's ginger ale, it's less sweet and just a bit more spunky in flavor. If you want to make some of this ahead of time, combine everything but the ginger ale in the pitcher and refrigerate for several hours. Add the chilled ginger ale when ready to serve. Made this for Thanksgiving Dinner 2018. Will make again for Christmas. This would be very good with some “adult add-ins”, or as a sangria base. Thank you for sharing! great cocktail for this time of year, but I’d even drink it in June! So thank you for this recipe! Thanks for sharing! Does the mix keep long? I’m dying to try this recipe but I’m not a huge fan of sweets so I’m going to make it with Club Soda. I just love this punch so much! Making it tonight for the THIRD time in a week! 🙂 So yummy & festive. I often add a bit more ginger ale than the recipe calls for…love the bubbly. Thanks, Mel! Just had it at a work party and I’m going to make it for my family thanksgiving tomorrow. Have you tried it with Reeds Ginger brew ginger ale? What brand of apple cider did you use in this recipe. I usually use a brand local to an apple orchard near my home. can alcohol be added and if so…what kind vodka? Absolutely delicious and beautiful punch. A big hit on christmas eve, but kids take out the berries. had this for Christmas dinner. everybody loved it! This sounds so good. Did you use actual cranberry juice or a “cranberry juice cocktail” (like Ocean Spray’s brand, for example)? This looks really refreshing! This will defiantly be on the menu for tonight! Made this tonight for a Christmas party and it was a hit! So good! Thanks Mel! I just made this punch and it looks like a dirty reddish brown instead of the pretty red that yours looks like. Any ideas why?? Not sure – maybe the brand of apple cider? What kind did you use? freshly home pressed the day before i used it. YUM!! Perfect for my Christmas Eve gathering – so glad I stumbled on your recipe! Tried this today to have with dinner. It was very good although next time I will only put 1/4 cup sugar vs a half. My 3 year old loved it! This looks so refreshing and delicious! I wish I was sipping on some right now! I’m curious – what’s on your Christmas Eve menu? And Christmas day? Please share! Hey Angela – good question! 🙂 We usually do lasagna (the classic Italian lasagna on my site and then usually one other one – this year my 8-year old is begging for seafood lasagna) on Christmas Eve with a yummy salad (probably the new pear one I posted a few weeks ago) and breadsticks and then creme brûlée for dessert. Christmas Day is pretty simple around here. I’m going to make the Brown Sugar Baked Ham in advance and pull it out on Christmas day to eat with rolls (probably in late afternoon). We always do cinnamon rolls for breakfast (this year I’m doing the new cinnamon twists I just posted) and I’m posting a recipe for the eggs we eat on Christmas morning too. Then after we open presents I pull out a big (super easy!) spread of crackers, cheese and fruit. I am totally trying this. We have a big bottle from Costco of cranberry juice I’ve been looking for other ways to jazz up. this sounds heavenly! Thanks for another winner! !